Since the Blender render template has reached the point where it can do everything that 3ds max does: render assets without AA against background and shadows separately. Also it can used to render animations as well. However, the workout with that is little more difficult since you have to either render both the model and the shadow into separated folders and use the video editor to create a sequence that includes them both or duplicate the animation frames for both, but I'll look into that in the future. I require feedback and testing. 2. Append your model (Shift-F1): modelfilename.blend\Object\ Select all except camera and light. 3. Move your model in YX axis so the model is above X and below Y. The zero point is the same as the zero point in SHP builder (sprite's "top corner"). 4. 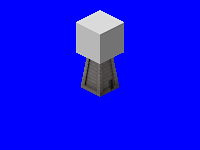 To render model: go to Text editor and select Render.object from the list and click Run Script and hit Render. F3 to save the image. 4. To render buildup: go to Text editor and select Render.buildup from the list and click Run Script and hit Render. 5. To render shadows: go to Text editor and select Render.shadows from the list and click Run Script and hit Render. 6. To render preview image: go to Text editor and select Reset from the list and click Run Script and hit Render. 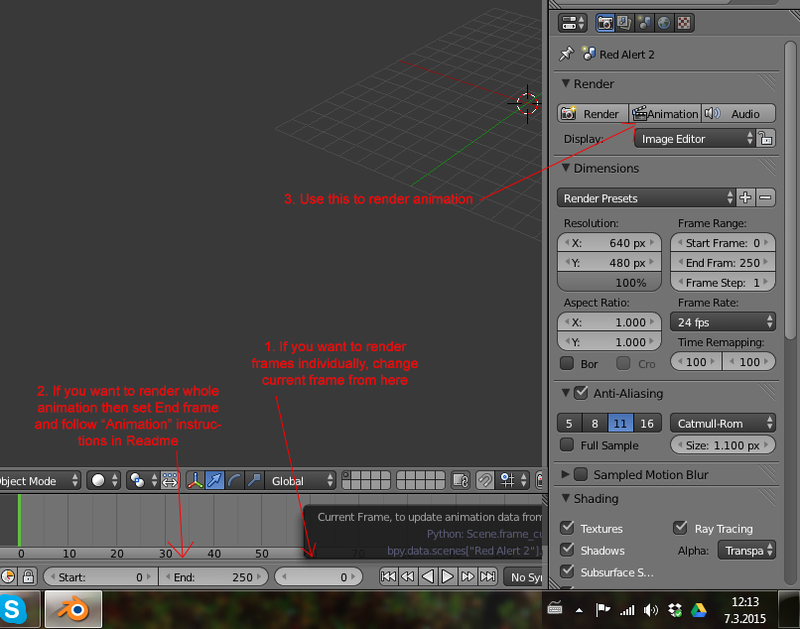 -By default Blender has a bit blurry texture filter which makes some texture details hard to see. 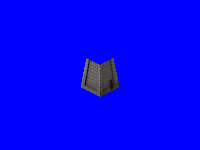 This can be fixed by setting all your texture 'Filter Size:' to 0.6 in Texture > Image Sampling. Licence: You freely to make changes of this template to match your needs. You can use scene settings as a reference to create your own template. 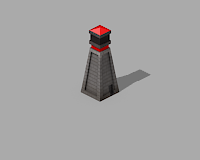 Also stickied because I want to attract more people to use Blender to create more C&C assets and don't want it to disappear and be forgotten during time. I see there's like 7 downloads, but no comments? Nice work. Can I have that tower in SHP format? 12 downloads and still no comments from the template users. @Aro: Haha, thanks! Is it ok even if it'll be public asset? Hmm, I use lightwave so I will need to either find one for LW, create my own or port to blender. Might check this out as an example to see about making a LW version if that's ok? Added RA2 template and updated TS template. @Rice: Feel free to use it as you like. Can you post that tower in SHP format and RA2 size please? I noticed that the current lighting might be a bit off and the edge anti-aliasing removing removes too much detail so I'll try to come up with a better solution. Any feedback? I am just starting with Blender and your script was exactly what I was looking for - thanks! What do you people think of combining RA2 and TS settings in one template where you just need to use script to toggle between RA2 and TS camera and lighting setup? Donut, yes please combine the two! You could even possibly put them onto separate blender layers. @DarkVen9109: insteresting, a year ago? @Palkia323: Realized that I just could use different scenes to achieve that same goal. Well, updated the first post for results. I second the idea of combining the two. Do the two differ only by camera distance to account for the tile size? As for feedback, I have not encountered any problems yet in the process of learning 3D modeling/ Blender/ and using the script all at once. I could post my (embarrassingly rudimentary) attempts here if that may help you diagnose performance. As an aside, I was wondering if you would be open to posting more Blender models appended in the scene as learning material for a beginner such as myself. 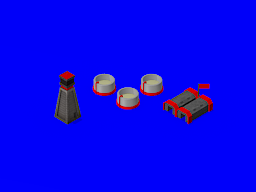 I would be interested to know how turrets and building animations etc. are dealt with. @Chrono: The difference is camera distance and different lighting. Well, post anything that would be useful for developing this template and helping with usage. 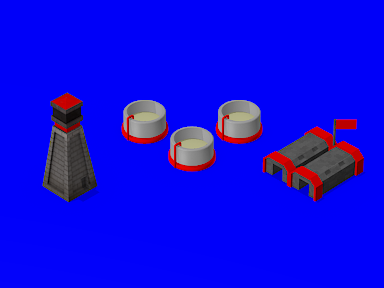 I think I might include appended models with animations in the future... Or in a different template .blend file. Nice little observation, you can use material 'Pass index: 1' for an object to hide anything behind it and yet it doesn't cause any AA. 3D clipping sounds like a headache already. DonutArnold: LOL!! It really felt like it was just years already. I left and forgot my responsibility as I modder. I feel like I can't do it. But I'll do my best. I'll just look for some helpful tuts in YouTube. I'm really late for the response, but yes. I've been playing with this a bit so I figure I'll just leave this here. I probably won't make this into a SHP since I don't need it, I was just experimenting. Any chance a template for RA/TD will be made some time soon? It would be very helpful for modding OpenRA. @deathreaperz: I like the model, but I'm not too fond of the texturing. 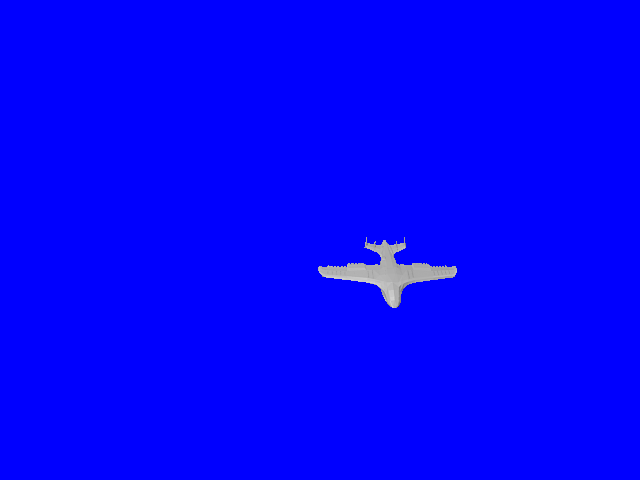 In time, I may be able to make some actual textures with GIMP. Right now I just textured each piece with a solid color. Amazing, I was just going to ask the same question regarding a template for RA/TD, just not with OpenRA in mind. Haven't thought about RA/TD much, but since you ask for it I'll take a look at it. Could you tell me what kind of specifications does it require? @Darkstorm: How's the usability and do you have any ideas for general improvements? It's nice to see you guys using the template, keep it up! It's quite helpful, I'm just a beginner modeller so quality is bleh. I don't quite understand how buildups and animations are suppose to work, are you just suppose to render frame individually? As for RA/TD requirements, I figure the biggest difference is the camera change since RA/TD is more vertical than TS/RA2 but not totally. Other than that, I'm not quite sure. 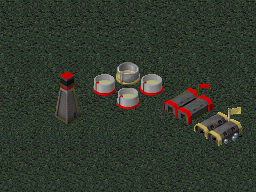 http://www.mobygames.com/images/shots/l/64798-command-conquer-red-alert-windows-screenshot-without-any-attack.gif is a screenshot of RA showing units and structures. TP came up with great specs for RA/TD. Also, while working with RA/TD template setting I noticed that there's a bloody wrong mistake with general lighting settings that I haven't fixed that caused lights to overlap scenes. It's now fixed in the next version and will upload it as soon as the RA/TD scene is done. Has potential for a possible Red Alert High-Definition 2D project. That looks pretty cool. I think it is still a bit off in perspective though. It's less noticeable for the silos but the barracks definitely looks off, still, it's probably close enough for buildings at least. The real test is whether units will fit. I think part of the problem may be that the perspective might not be consistent across the graphics in RA and TD anyhow making it difficult for a generic template to match all the original stuff. The problem is WW used a perspective camera not a orthographic(isometric) camera, and they rendered stuff from all over the camera view, they didn't place most of the stuff in the center of the camera, thus everything has different perspectives even the units. The area where the repair pad behind the Barracks is is where the RA conyard would be based on the perspective lines. You can't really get it exactly right without knowing WW's camera settings and building placements relative to the camera, just approximates. Thanks for you input guys! I tuned the FOV a bit since it's value actually wasn't enough high. Regarding the off topic w3d question, a google for "export w3d files from blender" suggests its not possible, at least not well enough you can use blender for that kind of dev. Next time, start your own topic when you have a question that isn't relevant to the current discussion. At least all the vehicles seem to use the same perspective. The buildings are just kind of weird, although it probably only sticks out because you've recreated what already exists. If you made new buildings at a single perspective, they probably wouldn't look so out of place. Hey guys, I've released version 2.01beta, check the first post for version changes. 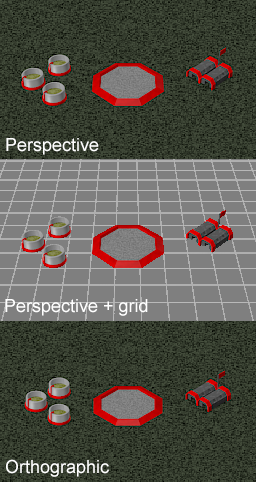 It also has isometric (orthographic) camera for terrain rendering. @Darkstorm: I made those just for a reference to match camera and lighting settings. Top of the repair paid is the "zero point" which the camera targets. I just released version 2.02beta which added new feature to scale output canvas which speeds up post-work that requires canvas scaling. Also fixed shadows that didn't appear at all or had wrong contrast. Note: this template stays beta until it is properly tested by public. Today I downloaded the latest version to find that you have included a nice readme along with render scripts (including a reset!). Would it be possible for you to put this on github (or would you be alright with me doing so?) so other may have easier access to it? A note I'd like to point out: In the README you state "Select correct template scene (Tiberian Sun or Red Aert 2 or Red Alert / Tiberian Dawn)" which even as an avid Blender user, I was not quite able to understand, though I did eventually figure out that it is in the Outliner as the top-level node. Either way this is fantastic and I've had nothing but a good time using it, keep up the excellent work. @Zengar_Zombolt: For texture: http://youtu.be/Ix6_j-PMtSE?t=2m9s And for more frames, check the attached pic. @Phrohdoh: I'm not currently using github, so it's ok if you could put it there. And I'll write the instructions to find the correct scene better. But everything else is rolling fantasticaly! @Zengar_Zombolt: Create an empty, then on your actual object apply a ChildOf constraint that references your empty. Then make keyframes where necessary and rotate the empty instead of your object. Check the attached example scene. @DonutArnold, thanks! I'll include that image in the readme too. Which license should I put on the code? Well I;ve gotten further, Textures work, and I have the child of set up. Okay I have the Animation and texture working, How do I get it from the Renderer to a file type I can Pop into somehting Shp-full? You will want to render the animation (make sure you set the output directory), then use OpenRA.Utility to convert a list of PNGs into a SHP, given you also have the palette file to use. Or use any other method to convert png -> shp. https://github.com/OpenRA/OpenRA/wiki/Converting-a-3D-infantry-model-to-sprites may be of help. What happened to my comment that the OpenRA code for generating TD/RA shp files was (as far as I can tell) the worst option out of that, XCC and Red Horizon Tools? Database error or silent moderation? I felt it provided valid information for people deciding what tools to use. For the record, the reason the OpenRA encoder isn't the best choice is that it doesn't attempt to implement LCW(Format80) compression correctly (as far as I can tell in the code anyhow, feel free to correct me), it's just a quick placeholder implementation that implements the simplest commands and leads to larger files than neccessary. XCC and Red Horizon try and implement it fully (though XCC at least doesn't match the original WW encoder in efficiency). None of them seem to implement XORDelta(format40) for shp files at all so no tool that I'm currently aware of does it correctly as the WW tools did, preferring an attitude of "it works" rather than "it does it correctly" it seems. My apologies, didn't realize that not everyone uses "View posts since last visit" or "View your posts" from top right of the site. Next time will provide better moderation and leave a notification in the topic where the posts were split. Just to check, are you guys satisfied with the template? And is there something you wish to change or add or fix?